System Studies' High Resolution Pressure Transducers™ use solid-state, integrated circuit technology to provide greater accuracy and dependability for remote air pressure measurement. The transducers produce readings in the range of 0-30 Pounds per Square Inch (0-207 kPa) with resolution down to 0.1 PSI (0.7 kPa). Because their output is linear (from 4 to 20 milliamperes), as opposed to the 0.5 PSI (3.45 kPa) stepped readings of resistive transducers, they are capable of detecting very subtle changes in pressure. And unlike resistive transducers that have an internal resistor scale and wiper arm that can malfunction and cause inaccurate readings, our pressure transducers provide extremely dependable performance. The High Resolution Pressure Transducers are available in a variety of configurations to suit your specific application. Variations pertain to the type of fittings supplied and the transducer's intended application / installation. Central Office Panel Mount Includes a wire cover assembly with 2 pairs of conductors in a protective sheath. Please note that a four digit part number and a two digit pneumatic fitting designation must be specified for each transducer when ordering. BB Transducer supplied with nickel-plated brass, barbed pneumatic connector. 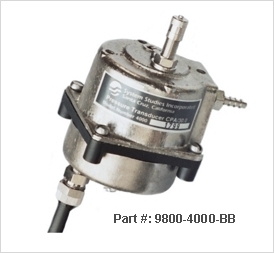 BR Transducer supplied with nickel-plated brass, barbed pneumatic connector on a 90° elbow..
BS Transducer supplied with nickel-plated brass, standard tubing connector. For use with 3/8" plastic tubing. BT Transducer supplied with nickel-plated brass, 1/4 inch tubing connector. SC Transducer supplied with nickel-plated brass connector. For use with 1/8" pre-formed stainless steel tubing. SS Transducer supplied with stainless steel, 37° flared tubing connector. For use with 1/4" stainless steel braided tubing. If you ordered part number 4002-BS, for example, you would receive a High Resolution Pressure Transducer designed for a conventional five or ten bank transducer housing. The transducer would be supplied with a nickel-plated brass 1/4" male NPT fitting for standard 3/8" plastic tubing. Pressure transducer model 4003-SS consists of a stand-alone model with a 37° flared stainless steel conductor tubing connector and a 37° flared pneumatic tubing connector (for use with 1/4" stainless steel braided tubing). This model is not supplied with conductor wires.